Take your relaxation to the next level in one of our Spa Crest hot tubs. All Spa Crest hot tubs are handcrafted and ergonomically designed to offer remarkable comfort and visual appeal. Whatever seat model you choose, rest assured, the jet designs and patterns of each of the Spa Crest hot tubs in this unique line have been carefully crafted to deliver the most therapeutic massage available. Venturi type air injection – Rubber pump pad mounting system for quiet operation – ReflectoTherm insulation system – Fully sealed molded ABS bottom – No maintenance synthetic cabinet – Full body massage lounge (available on lounge models) – Easy access Skimmer filtration – Underwater light (with coloured lens) – Digital LED light standard on all international models except LXs – Microban Lucite Acrylic – Barrier-free seating – Interior doorway compatible (34″) – Programmable filter cycles – Zone therapy – Ozone standard on all models except LX. 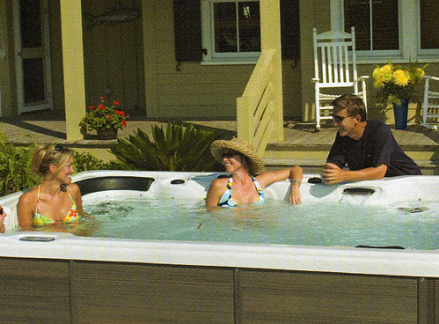 An exceptional product line at an exceptional value, that’s Coastal Hot Tubs. Simply choose your desired number of seats and whether you want the comforts of a lounge or chair arrangement and soon, you will be surrounded by warm soothing waters for a renewing experience inside and out. Venturi type air injection – Rubber pump pad mounting system for quiet operation – ReflectoTherm insulation system – Balboa digital control system – Fully sealed moulded ABS bottom – No maintenance synthetic cabinet – Full body massage lounge (available on lounge models) – Easy access Skimmer filtration – Underwater light (with coloured lens) – Digital LED light standard on all international models – Microban Lucite Acrylic – Barrier-free seating – Interior doorway compatible (34″) – Programmable filter cycles – Zone therapy – Pillow headrests – Waterfall – Custom neck massage seat. The ultimate in relaxation is yours when you choose a Vision hot tub. Created to be the most well built hot tubs on the market, each Vision model is a glorious example of the difference attention to detail can make. Choose from a full offering of available upgrades and you will soon experience the physical, emotional and spiritual renewal only Vision Hot Tubs can bring. Venturi type air injection – Rubber pump pad mounting system for quiet operation – ReflectoTherm insulation system – Balboa digital control system – Dual topside controls – Fully sealed moulded ABS bottom – No maintenance synthetic cabinet – Full body massage lounge (available on lounge models) – Easy access Skimmer filtration – Underwater light (with coloured lens) – Microban Lucite Acrylic – Barrier-free seating – Programmable filter cycles – Zone therapy – Pillow headrests – Waterfall – Custom neck massage seat – Accupressure foot therapy system. Here are some of the options that can be added to Spa Crest hot tubs, Coastal Spa hit tubs and Vision hot tubs (not all options are available on all hot tubs). This top of the line system includes 2 premium pop-up speakers and a subwoofer, deluxe waterproof remote, and docking station for your IPod and MP3 player. We install state of the art transducers with all of our stereo systems. These 4 hidden transducers are moulded to the spa shell turning the entire spa into a speaker. Coupled with our powered subwoofer, we create a true surround sound audio experience. This waterproof floating remote will operate the spa functions and works as a universal remote to control any other audio/video component in your home. The Spa Monitor remote allows you to control your spa from the comfort of your home. In-Home Remote standard on all international Vision models. •Cycling through all of the colours slowly or selecting your favourite colour for continuous mood lighting. •Enjoying the soothing “slow fade” option, for example fading from blue to green. •Entertaining a crowd with the “party mode” which provides rapidly changing colours for added fun. Add a LCD waterproof TV package to any Coastal hot tub. Package includes 19″ waterproof TV, all weather DVD/CD/AM/FM/MP3 player, 4 transducers and a powered subwoofer.